Materials for Biomedical Engineering: Absorbable Polymers provides a detailed and comprehensive review of recent progress in absorbable biopolymers and their impact on biomedical engineering. The book's main focus lies in their classification, processing, properties and performance, biocompatibility, and their applications in tissue engineering, drug delivery, bone repair and regenerative medicine. The most up-to-date methods used to obtain such polymers and how to improve their properties is discussed in detail. 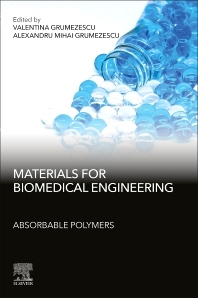 This book provides readers with a comprehensive and updated review of the latest research in the field of absorbable polymers for biomedical applications. 13. Analytical methods in resorbable polymer development and biodegradation tracking"